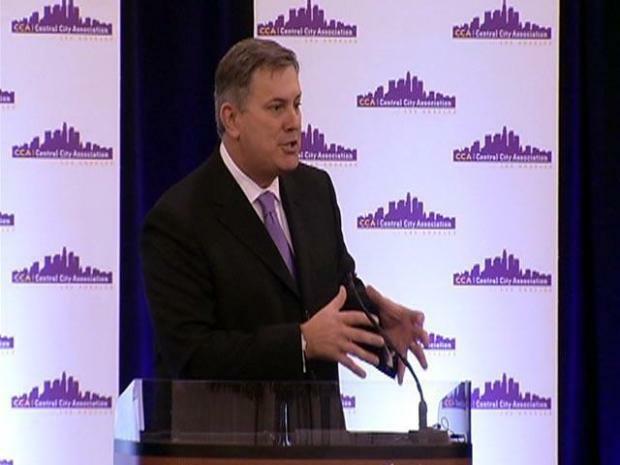 Nothing less that how to make LA the event capital of the world was the subject tackled by downtown's most prominent CEO, Tim Leiweke of Staples Center and LA Live renown, speaking to Central City business people. And his answer, to no one's surprise, is to build a new billion-dollar stadium next door at the convention center. Not only for NFL football by 2015, but also to expand LA's convention business. "We are the second largest marketplace in the United States. We're going to act like it," said Leiweke during Wednesday's meeting. The plan would entail $350 million from government issued bonds, but Leiweke guaranteed their pay-off from event taxes, or AEG's pocket. The CEO of LA Live is working to bring football back to LA, and to make the city the epicenter for the world's sports, entertainment, business, technology and live events. AEG is trying to catch up with a Staples Center partner, developer Ed Roski, who two years ago unveiled his own proposal for an NFL stadium 20 miles to the east in the city of Industry. "We have great respect for all of the other people talking about returning football here, and we're very supportive, but if we can solve this vision, we will be able to compete for every major convention in this country," said Leiweke. Among the hurdles, the NFL cannot act on any proposal until it works out a collective bargaining agreement with its players. Plus there are complex issues that need to be worked out with City Hall and state environmental law. If Leiweke brought a surprise up his sleeve it was that he intends to resolve those quickly, by next spring. "And if we can't, then we won't do this, we'll move on, and we'll let others have at it," said Leiweke. "He can talk anybody into anything, anytime, and make you feel good about it," said LA councilwoman Jan Perry. As of now a new NFL event stadium is far from a done deal, but if AEG can stick to the Leiweke timetable, by next spring AEG should know if the deal can happen. If not, Leiweke says, AEG will step aside and let Roski take his turn at making the touchdown and bringing football to LA.